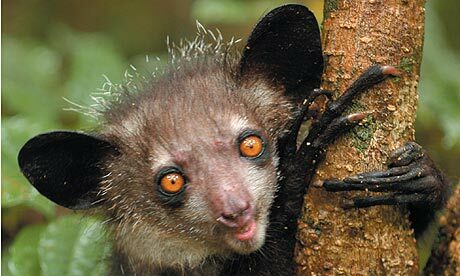 Today I want to write about a really ugly species, the aye-aye. These strange looking primates grow up to 37 cm long and have a tail that’s even longer. When they were first discovered, they were thought to be rodents or squirrels. They are nocturnal and have very long, skinny fingers that they use to catch their food. They tap on rotten tree trunks with their long middle finger to find wood-boring grubs. When they hear them, they break through the wood and hook them with the claws on their finger. Their teeth never stop growing, so they constantly chew wood and nuts to stop them from growing too big. Aye-ayes are found on the island of Madagascar and were thought to be extinct until 1957 when they were rediscovered. Today they are still considered endangered, mainly due to habitat loss. Are there any other interesting facts that you would like to share about aye-ayes?